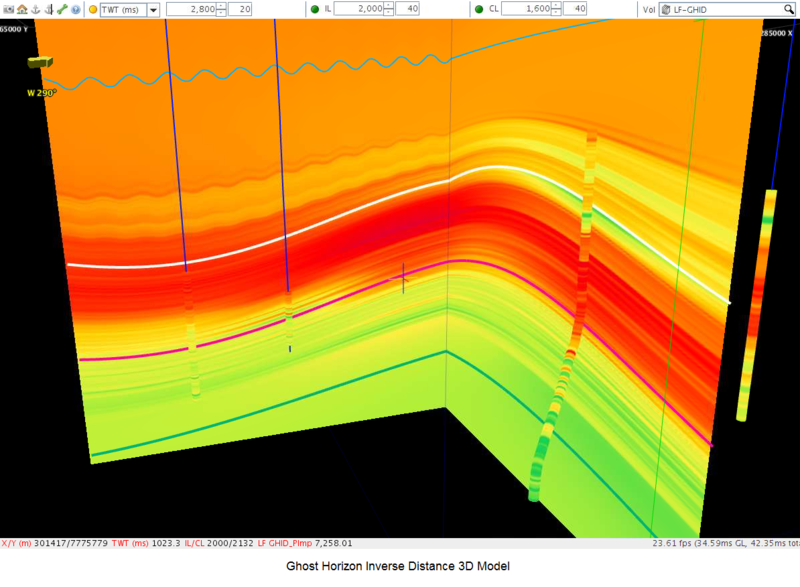 Description Construct detailed layered models from well data using inverse distance weighting. 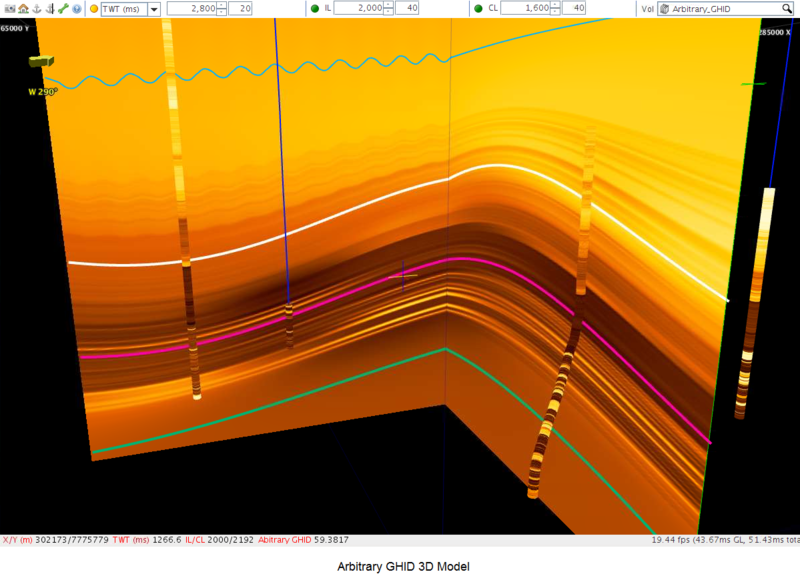 The Low Frequency Model (GHID) process constructs detailed layered models from well data and supporting information. 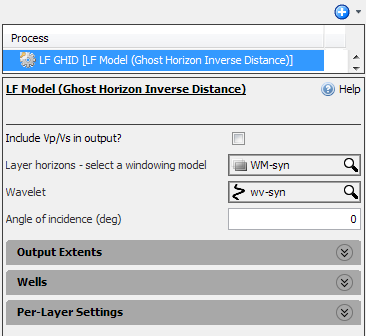 Window model layers are automatically divided by ghost horizons using the conformability specified in the windowing model. Well values are selected for the model at the intersection between each well and the ghost layer. These values are combined according to the specified per-layer settings. The structural behaviour of the model is controlled using a windowing model (see Creating a Windowing Model). If a wavelet is specified, a synthetic seismic volume will be generated. The resulting models and synthetics are useful for forward modelling investigations and also as inputs for seismic inversion. Arbitrary GHID models can also be created using this process. Scroll down and double-click LF Model (Ghost Horizon Inverse Distance). In the Details Panel, select the Include Vp/Vs in output? check box to generate a Vp/Vs volume as part of the process output. Select the windowing model to be used in the process at Layer horizons - select a windowing model (see Creating a Windowing Model). At Wavelet, select the wavelet to be used in the GHID modeling (see Creating a Wavelet). Type the angle of incidence for the GHID modeling at Angle of incidence (deg). The wavelet and angle of incidence are used to generate the synthetics volume. In the Output Extents section, select a survey to be used in the GHID modeling process at Survey. Type the range of Inline extent, Crossline extent and time/depth extent (TWT/TVDSS) for the GHID model and the respective sample intervals. In the Wells section, select Elastic curves or Any one curve to define the type of curves to be used in the GHID modeling. Select the Specify well curve vertical extents (ms) check box to allow you to define the well curve vertical extents for each well that you use in the GHID modeling. 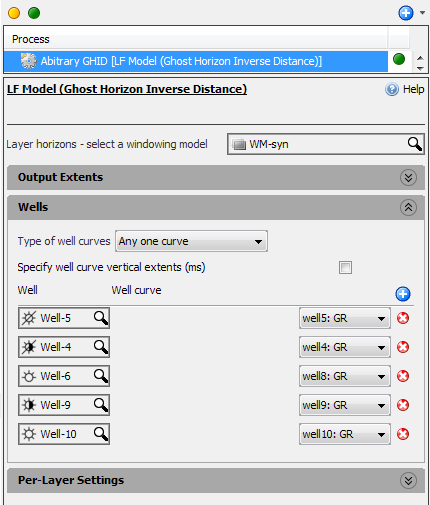 At Well, click the Add Row icon to add the wells used in the GHID modeling and define the compressional, shear and density curves for each well. 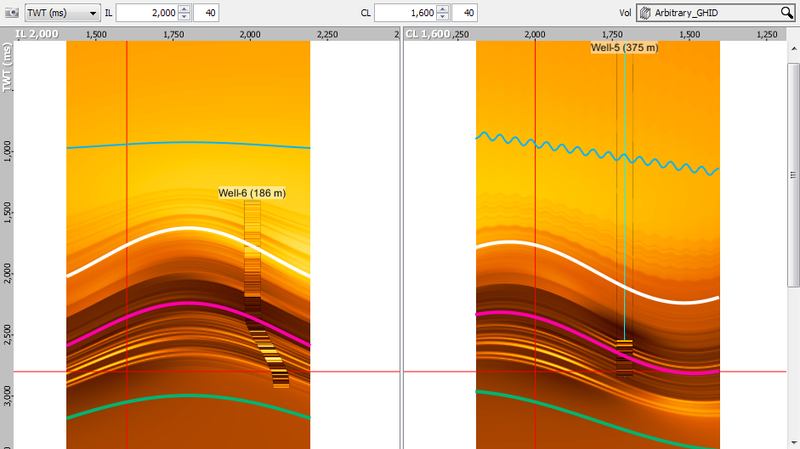 If you have selected the check box, type the vertical extents of each well used in the GHID modeling. In the Per-Layer Settings section, select the calculation type to be used in each layer in the windowing model. 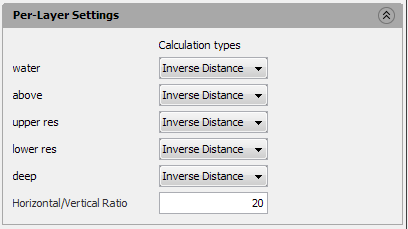 Available options include Inverse Distance and Average of well values. As a result of this process, new GHID volumes are available in the Volume tab. If you have selected to generate the Vp/Vs volume as an output in the process, you will also see the GHID VpVs volume in the Volume tab. 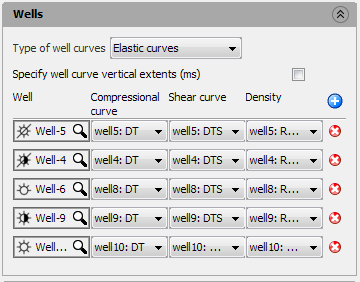 At the Wells section, select Any one curve as the type of well curve. 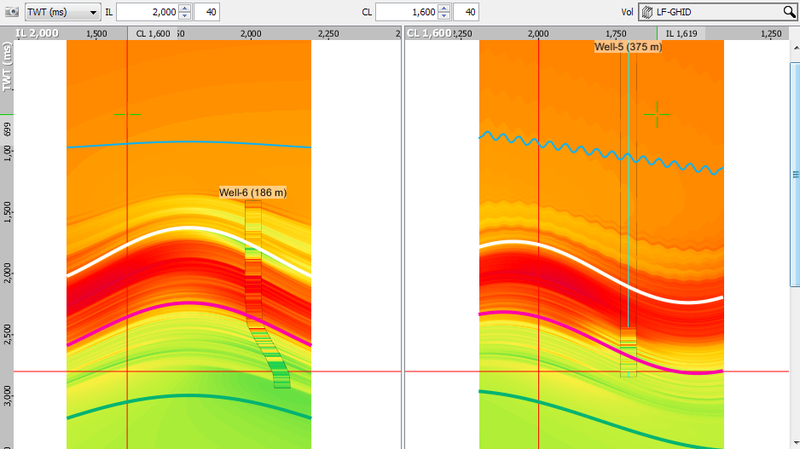 Click the Add Row icon to add the wells used in the GHID modeling and define a curve for each well. Follow the above configuration of the Output Extents and Per-Layer Settings.